Last weekend marked one week before the first DLC release for the PC. To try and call out some attention to Call of Duty Black Ops 2 for any PC players that hadn’t yet taken the plunge and purchased the game; Activision/Treyarch kicked off a weekend long deal of a “Free To Play” weekend on Steam, a Steam sale on Black Ops 2 (33% off – $40 for the stock game or $54 for the Digital Deluxe Edition) and to top it off a Double XP weekend. The thinking behind this is the first DLC release is a week away and this would be the best time to make a last good push at really selling the game so that more people would be playing and there would potentially be more interest in future DLC purchases. Chances are if individuals purchase the game now they are more likely to purchase the DLC as well versus buying the game six months down the road. We have seen these same deals happen in the past however I am a numbers guy and I found the player count numbers very interesting over this Free To Play weekend because how low Black Ops 2 player counts have been from the start (60k – 50k versus previous titles over 100k). 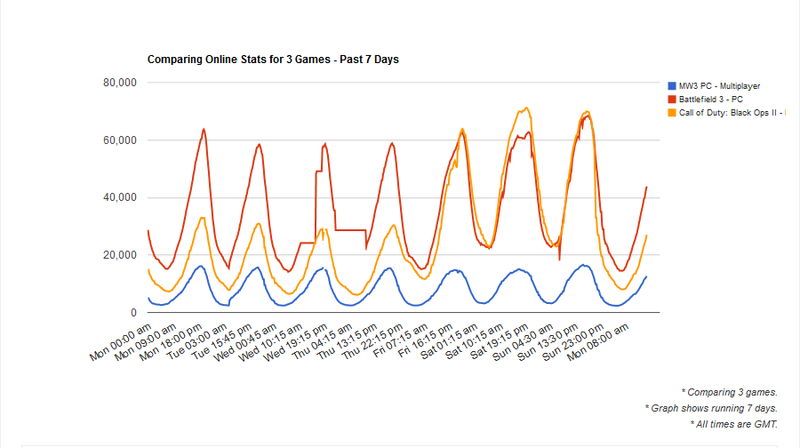 It seems by comparing raw player counts from Black Ops 2 to previous titles people have really held back purchasing Black Ops 2 for whatever reason; tired of the series, it being a Treyarch title, lack of proper dedicated servers & tools, whatever – but as you can see in the first graph below the peak player counts for the Free To Play weekend actually more than doubled the normal peak player counts for the game. The normal peak player count has been sitting around 30k to 35k but the Free To Play weekend ushered in 63,871 on Friday, 71,228 on Saturday and 70,024 on Sunday. Now when a game on the scale of Call of Duty is offered free to play for a weekend sure there will be plenty of random people just trying the game out for the heck of it that normally aren’t all that interested in the Call of Duty series; however, on the other side of the fence there are a large number of people that purposely didn’t buy this game for reasons previously mentioned and now these people are actually playing the game. So the question goes out to Activsion, Treyarch and Infinity Ward – what can you do to get these players into – or back into – the game once again? What are you willing to do to get these sales numbers at release time? This clearly shows that there is more interest in the game on the PC platform side that has not been achieved in sales on the publisher/developer side and this should be a very clear sign that if you put more time and effort into supporting the core features that a still large part of the PC community is looking for in the Call of Duty series you could achieve much better sales numbers on this platform. The question is – is it worth it? Is it worth competing with peak player count numbers in the same realm of your competitor EA with a title like Battlefield 3? Because that is exactly what this Free To Play weekend did. For the first time in quite a while Black Ops 2 was actually above the Battlefield 3 peak player count for the weekend. I know the PC market is a very small fraction to the gigantic console revenue that is being taken in but I would have to think that seeing numbers like this on the PC platform side all the time would still be in someones interest in Activision. Unfortunately, just looking at the peak player count numbers it doesn’t really seem that the Free To Play weekend or even the sale did much to spark additional interest in Black Ops 2 as the peak player count numbers beyond Sunday went back to pretty much the same figures in the 31k to 35k range. I’m sure there were some additional sales involved over the weekend – actually very sure as I played with a number of new players on Monday and Tuesday night – but if the Free To Play weekend and sale was a glaring success we would definitely be seeing some peak player count numbers above 35k. Granted the numbers we are looking at here are just “peak” player counts and not overall total player counts so this does sway the point a bit but the numbers are still a consistent value to gauge day by day. We’ll have to see how the numbers gauge differently over this next week with the release of the Revolution DLC this past weekend.